Illustrated obscurity: Cheap Chic is Back! And it's just as good as ever. The fashion classic (first published in 1975, with an unsuccessful "update" in 1978)) went out of print sometime in the early 80s (although you could still find used copies around) and first editions were recently selling for outrageous prices online. Happily, Random House has re-issued Cheap Chic with a new forward by Tim Gunn. I was a worried they would try to "update" it again, but it is as it was back in the day. The original introduction is prophetic, noting "we stuff our closets with masses of mistakes". And this was before clothing manufacture moved overseas and became really cheap. Their take on the subject is firm but gentle. They take clothing seriously as self-expression, but the idea of fashion lightly ("your look should be in harmony with the way you live, who you are, and not reflect what the fashion magazines (or even we) might say"). Cheap Chic is divided into chapters that take apart a wide variety of "looks", giving you tips, essentials, and plenty of inspiration with an abundance of black-and-white illustrations, such as a Levi-Strauss illustrated ad (I still want the Engineer's Coat! ), Greta Garbo in a suit, and even one of Bill Cunningham's hats. It then offers short profiles and interviews of famous and not-so famous fabulously stylish people. Kudos to book designer Bea Feitler, who tied it all together. My favorite chapters are Classics ("Sometimes Cheap Chic boils down to spending much more than you feel you can afford on the kind of classic, quality clothes we talk about in this chapter. We think it saves you money in the long run. "), Second-String Classics (if you really can't afford the Classics), Antiques ("It feels good to wear expensive clothes, especially when someone else paid for them the first time out"), and Work Clothes ("Since they were never designed to be in fashion, they can never go out of style"). But there's something for everyone here. 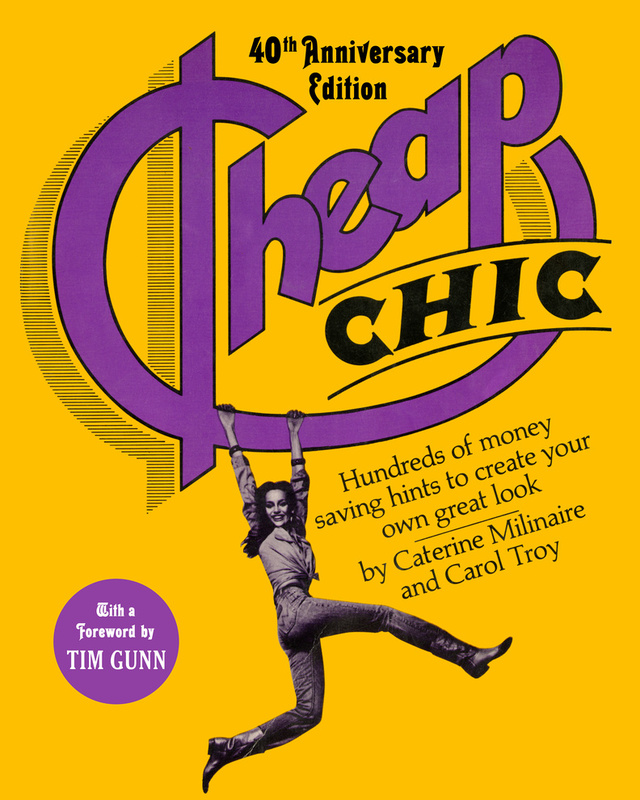 I owned and treasured Cheap Chic in college–I clearly remember taking a deep breath to pay full price for it in 1976, $5.95–but the lessons I learned from it have stayed with me my whole life. Can't give a better recommendation than that. And it's only $16.00 now! Go get it and be inspired.